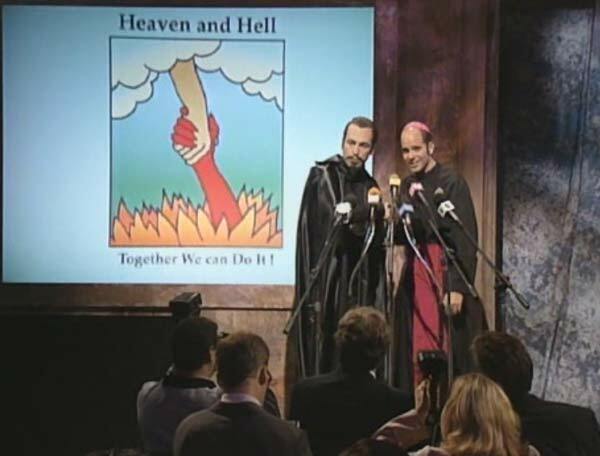 Bob Odenkirk and David Cross create an unholy alliance on Mr. Show. The wide swath of time between the 1990s and early 2000s were, to be quite honest, a fairly decent time for quality television. This, for you younger whippersnappers, was a time before a television program needed to seem like a cinematic masterpiece to be taken seriously. The 90’s saw Seinfeld, Friends, Frasier, The Simpsons, Chicago Hope, The X-Files and many more pretty solid series. It also saw Family Matters, Baywatch and Dharma and Greg, but that’s neither here nor there. Every era has its cult classics, however, and one of the most major distinctions of the 90’s/early 2000’s may be that it was a time when television executives largely had no clue of the gold mines on which they were sitting, as evidenced by some of the brilliant-yet-axed television programs of the time. We saw television programs from Ben Stiller, Judd Apatow, Garry Shandling and Mitchell Hurwitz fall by the wayside due to low ratings or executive neglect — programs which later would prove to be fundamental building blocks for some of today’s greatest talents and highest-paid celebrities. Lucky for all of us, the wise minds behind the Independent Film Channel (these days only known as IFC) realize that an entire generation still hangs onto and rues the loss of its most beloved fringe classics, and has made the very smart decision to reclaim that demographic by snatching up the entire — and sometimes brief — runs of those programs to air once again. The network tested the waters with the recent Kids in the Hall miniseries Death Comes to Town, which reunited the Canadian sketch troupers for another go-round in a murder-mystery whodunnit. It must have worked, as IFC has of late decided to take another embrace of some of the greatest comedies of the last fifteen years, and by doing so has amassed a collection of reruns which, together, depict an entire history of early “alt-comedy” and the foundation an entire comic landscape of today. It’s a genius move, it comes with a built-in audience, and it’s about damn time. Let’s look at what IFC’s gathering up and bringing back, both to a generation who loved it the first time and a new generation who should know where its Sarah Silvermans and James Francos were born. You have to hand it to them — in an age where every cable channel is jockeying to come up with the next Rescue Me, The Closer or Breaking Bad, IFC has perhaps hit on the simplest form of success: tap into an audience that already exists and is more than willing to watch these shows — which they’ve missed for so long — in the wee hours of the evening once again. What the network has also succeeded in doing, however, is creating an entire back-catalogue and history for today’s comedy pantheon. Any of these shows on their own are gold; but together, a larger picture of young talent which would take over the world in the years to follow emerges, and it’s both amazing and a lot of fun to watch. Get those DVRS ready. Check your local channel lineup for IFC. ← LPs from the Attic: Jamming with Edward!